If you follow me on Instagram or Twitter, you know I’ve been doing my own gel manicures at home for the past couple of weeks. To be quite honest, I wanted to cut some corners in my budget so that’s mainly why I decided to invest in supplies to do my gel manicures and pedicures at home and stay out of the salon. I tried a glitter gel mani on myself for the first time and shared it in my IG Story. 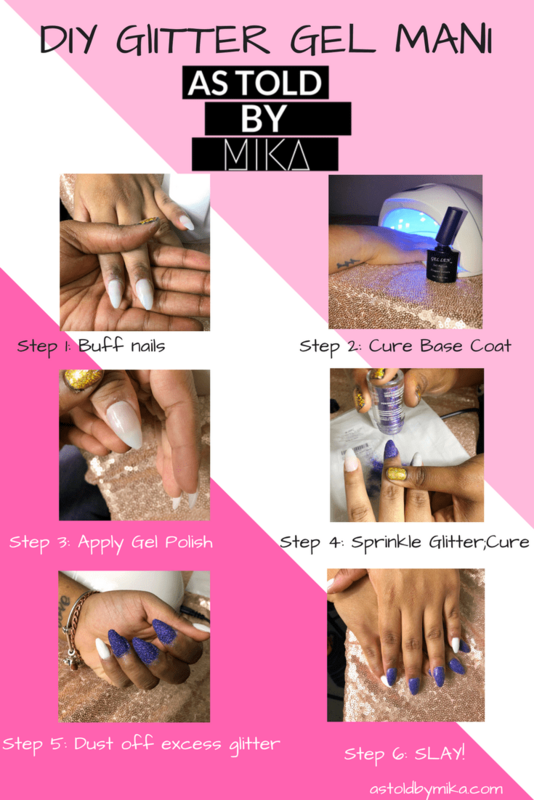 I was asked to do a detailed post on how I achieve my gel mani’s at home so here we are. Before I break it down here’s a good ole disclaimer. 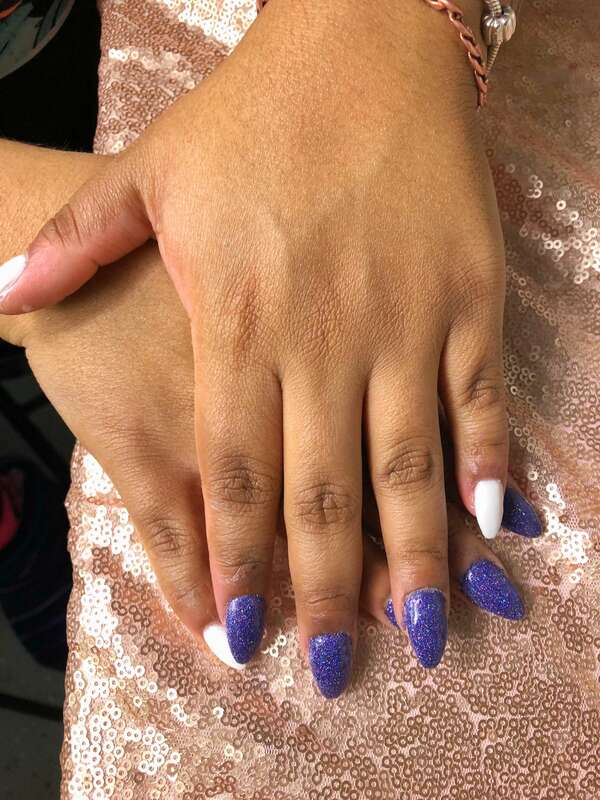 This glitter gel mani is a custom press-on nail set however you can use the same technique on your natural nails. FYI, if you want me to do a post specifically about making press-on’s let me know on Twitter. To ensure that your gel polish cures correctly under the lamp you need to make sure you nails are clean. 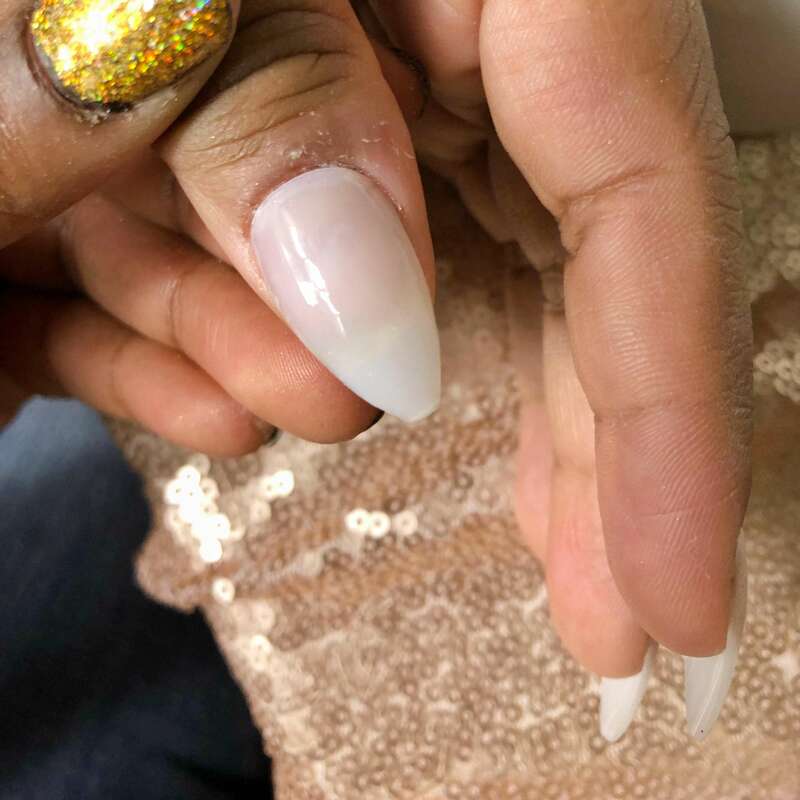 If you’re applying the gel polish to artificial nails it’s especially important to buff the nail to ensure the gel polish adheres. Applying a base coat is uber important if you want to make sure your gel mani lasts as long as possible. Be sure to apply thin layers. Apply a color of your choice to all your nails. I applied 3 layers white for the press on set curing ONLY after the 1st and 2nd layers. The 3rd layer I left wet in order to apply the glitter. Remember that 3rd layer that I didn’t put under the lamp–it was for this purpose. 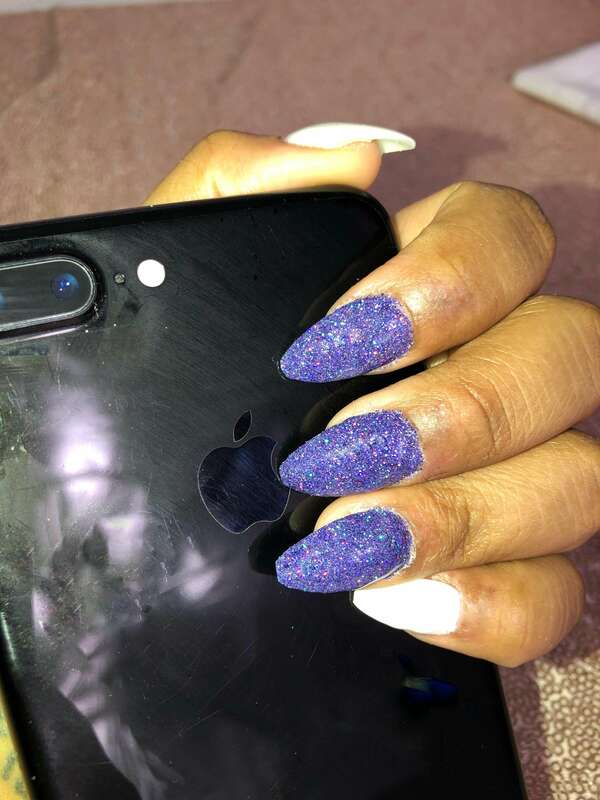 I sprinkled some NYX Face & Body Brillant’s Glitter in shade “Violet” on the uncured nails which allowed the glitter to stick. STEP 5: Cure nails for 1-2 minutes; brush off any excess glitter. 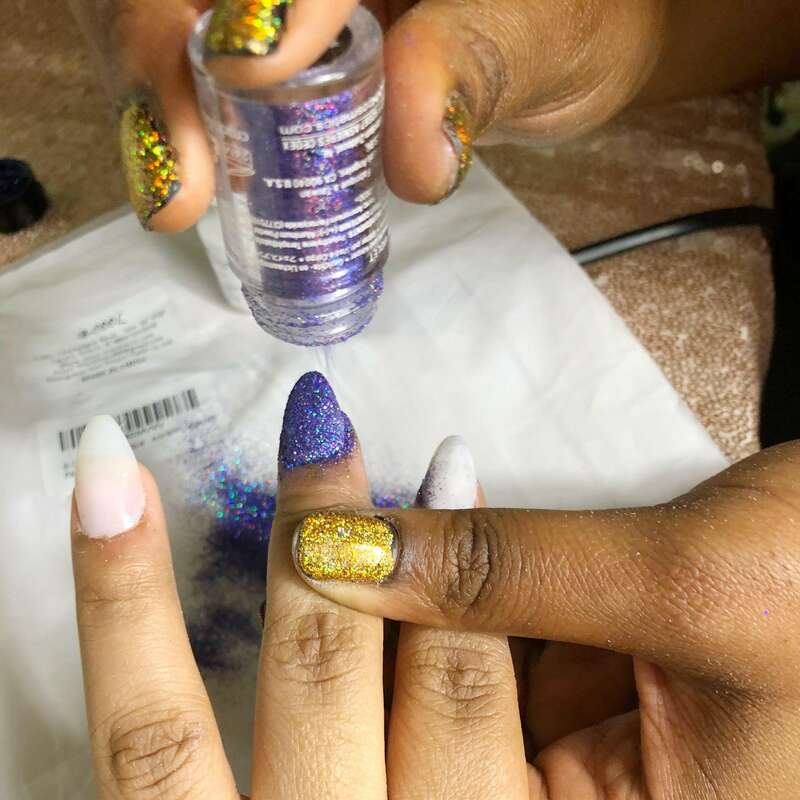 As long as you don’t get any base coat around your cuticle the glitter should not stick to your skin and should dust off or wash off easily. The glitter in this step still feels rough but the next step fixes that. STEP 6: Apply layers of topcoat until glitter feels smooth with regular gel nails. Depending on the glitter that you choose to use you may have to apply multiple layers of topcoat. Applying the layers thicker may help get it done quicker however you don’t want to do them too thick or the gel won’t dry completely under the lamp. As you can see the glitter looks more seamless with topcoat and it’s also encased in. 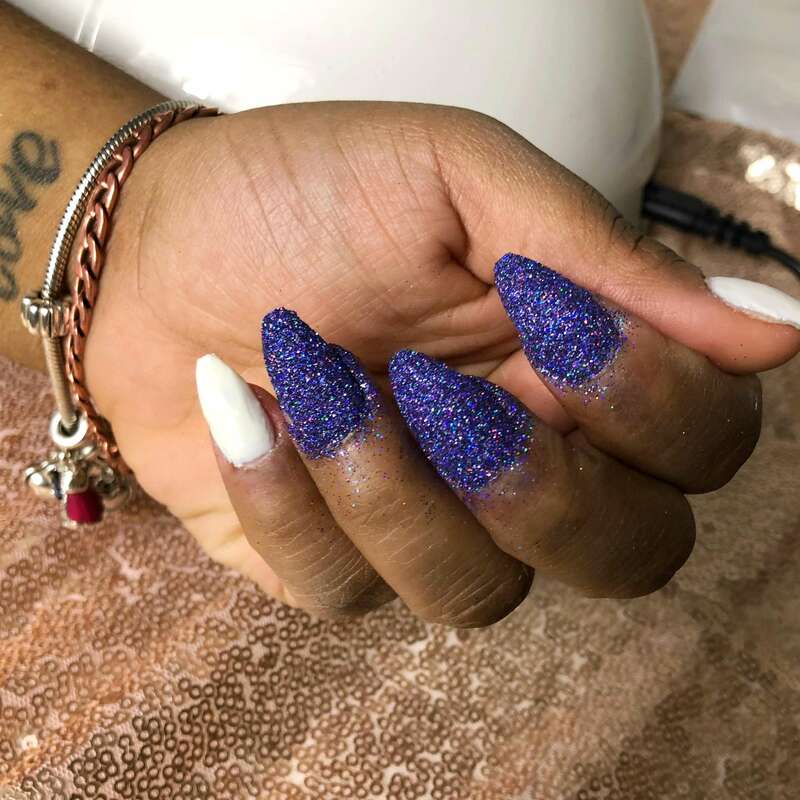 You are ready to slay in your at home glitter gel manicure. Pin the below photo to save this pictorial. Happy slaying!